WHAT IS KYOTO DRIP COFFEE? Kyoto Drip is a coffee brewing method that originates from the golden ages. Contrary to commonly known brewing techniques, Kyoto Drip is brewed using cold water instead of hot water. Although brewing Kyoto Drip takes somewhere in between 3 to 6 hours, the use of cold water has quite a few benefits that compensate the longer brewing time. Kyoto Drip barely oxidizes making it extremely easy to taste the subtlest of fruity flavors in the used coffee. Due to the absence of oxidation, Kyoto Drip has a lower acidity and less bitterness in comparison to hot coffee brewed with the same beans. Next to the beneficial flavor qualities of Kyoto Drip, it also doesn’t contain any calories because the fat in coffee beans is insoluble in cold water. Kyoto Drip on the rocks is the refreshing alternative for lovers of pure coffee that prefer to stay away from highly sweetened, milky, iced coffees that can be found everywhere nowadays. Thanks to the patient brewing method of Kyoto Drip all flavors are slowly extracted from the used coffee beans. The slow and cold brewing method will enable you to taste all kinds of fruity flavors combined with a chocolaty aftertaste. 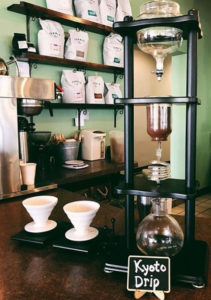 Kyoto Drip will let you discover coffee in its purest and fullest form and will surprise you with great flavors you wouldn’t find in the same coffee when using a hot brewing method. This is why Kyoto Drip is known in Asia as “the wine amongst coffee.” All the great aromas you smell when brewing a hot cup of coffee are flavors that evaporate into thin air. Using a cold brewing method will enable you to preserve all these great aromas in your coffee. When Kyoto Drip heats up in your mouth all these aromas will be released assuring an explosion of taste. Cold brewing methods can be lead back to Dutch traders of the Dutch East India Company. Although it seems unlikely that they actually used the devices we now know as Kyoto Drip makers, it is well known that they started brewing coffee using cold water because of the positive impact on the expiration date of coffee. This enabled traders to bring along great amounts of coffee during their long sea journeys. Also, the hot climate made a cold brew preferable to hot coffee. Most likely it was the culture of the countries the Dutch were trading with, such as Korea and Japan, that led to the final design of the impressive Dutch Coffee makers, which later gained the name of Kyoto Drip (also known as cold drip makers or slow drip coffee makers). After trading stopped, Dutch Coffee spread throughout Asia gaining popularity over time. The success of Dutch Coffee then spread to Australia and the United States, but strangely didn’t reach Europe. Now, approximately 300 years later, Dutch Coffee is coming back to the Netherlands and Europe! Let’s start by saying that coffee in itself is a great product either brewed warm or cold. Brewing cold does have some major benefits over warm brewing methods though. One of the side effects of heating the coffee is that it will rapidly start to oxidize. This oxidation will cause the coffee to become bitter and acidic. That’s why we all avoid a coffee pot that has been standing on a heating plate for too long. Although your warm coffee can still taste great it’s likely that the bitterness caused by heating your coffee grounds will result in the lost of beautiful subtle fruity flavors. That’s why it will be harder to taste the difference between two warm coffees than between two cold brewed Kyoto Drip coffees. DUTCH COFFEE, KYOTO DRIP, COLD DRIP COFFEE, ICE-DRIP COFFEE OR WATER DRIP COFFEE?